I love Snickerdoodle Cookies! I remember these cookies from my childhood--how could you not remember them with a name like "Snickerdoodle"? So, when I came across this Snickerdoodle Cake recipe on two different blogs, I had to give it a try! 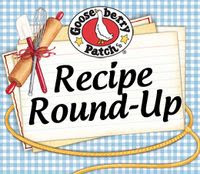 This recipe can be found at Dozen Flours and also at My Baking Addiction. Just looking at the pictures on these websites made me long to taste this cake. And then I read all the wonderful comments from people that had tried it....I knew it would be a winner! The only change that I made to this recipe was that I buttered the pan. I thought that butter might enhance the flavor of the crust more than Pam with Flour or shortening. I'm not sure if it did or not, but the cinnamon & sugar crust is definitely what sets this cake apart from your basic coffee cake. 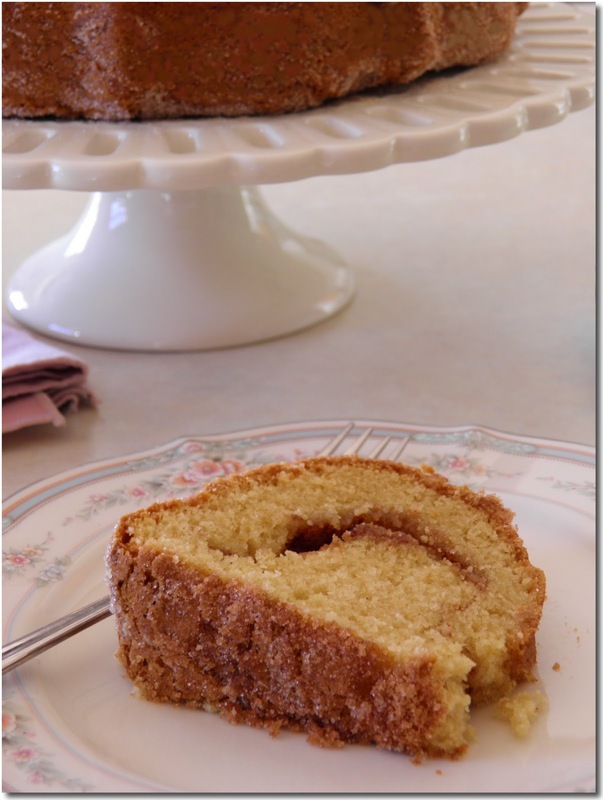 A delicious bundt cake with a cinnamon sugar swirl inside. 1. Combine 1 cup of sugar and 2 teaspoons of cinnamon. Preheat oven to 325°F.2. Here’s the way Julia from Dozen Flours made the crust: "Using a spray product like Pam with Flour, generously spray a 9 inch Bundt pan, being careful to cover all the nooks and crannies, as well as the center tube. (Note: If you don’t want to use Pam with Flour, you can just grease the pan with shortening.) Gently dust the entire inside of the pan with the sugar and cinnamon mixture. You should only need about 1/4 to 1/2 cup of sugar, but you want to try and evenly coat the inside surface of the pan, including the tube. Save the remaining sugar and cinnamon mixture and set everything aside." 3. Sift together the flour, baking powder, baking soda and salt and set aside.4. Cream the butter and sugars until light and fluffy.5. Add the eggs and vanilla and beat well.6. Add the flour mixture alternately with the sour cream and beat well.7. Spread half of the batter into the prepared pan.8. Sprinkle approximately 1/3 cup of the cinnamon sugar mixture over top the cake.9. Spread the remaining batter into the pan and sprinkle any remaining sugar mixture over the top.10. Bake in preheated oven for 55 to 65 minutes, or until toothpick inserted into cake comes out clean.11. Allow to cool for 10 minutes then invert onto a wire rack to cool completely. I can understand how this can leave you craving a bundt cake! Your cake looks splendid and moist! I love anything with cinnamon so this kills me. That is beautiful! My boyfriend LOVES snickerdoodles! I may have to make this for him for valentines day! This looks wonderful! I love snickerdoodle cookies so I'm sure I would love this! Perfect idea for a bundt cake and for all of us who LOVE snikerdoodles! It looks so delicious! I love cakes with cinnamon. Thanks for sharing! my sons fav cookies are those, so cant wait to try this cake he is going to love you! Yum! My grandmother and I use to take snickerdoodles to the lake and let them warm in the sun while we swam. They were the perfect way to warm up when we got out of the cool water! I had my first snickerdoodles over the holidays and I was enchanted. This cake would please everyone I know - love the cinnamon/sugary taste. It's inviting me to come and play. 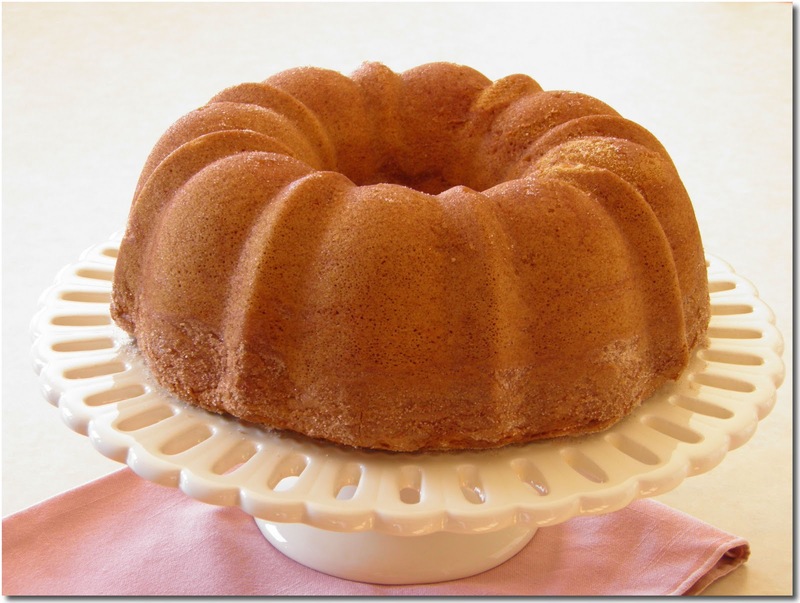 What a fantastic bundt cake. So craving the snickerdoodles now. :) The sugar crust looks wonderful. Tasty, but I wish it had been a bit moister. Leftovers were good as coffee cake the next day! What sort of glaze would you suggest? Or should I not put one n at all? I don't usually put a glaze on this cake, but you certainly could add a simple powdered sugar glaze.